Venezuela are last on the table as they have one point from seven games they have played, three points below Peru. On the other hand, we have the table toppers Argentina who have 14 points from seven games and are one point above Uruguay. 07th September 2016 at 05:00 (IST). Estadio Metropolitano Merida, Merida, Venezuela. Venezuela hasn’t been up to their mark in the qualifiers and after looking at their current situation, it would seem impossible for them to qualify for the final stage. They have played seven games and drew one and lost six, scoring seven goals and conceded 17 goals in total. They played against Colombia in their last game in the qualifiers and lost the game by 2-0. Venezuela had a pretty bad game as two of their players were sent off. Rolf Feltscher received two yellows. First one in 76th and the second one in the 90th minute and Wilker Angel won the first one in the 10th minute and the second one in the 79th minute. Rodriguez scored the first goal for Colombia in the 45th minute and then Macnelly Torres doubled their lead in the 81st minute to make it 2-0. 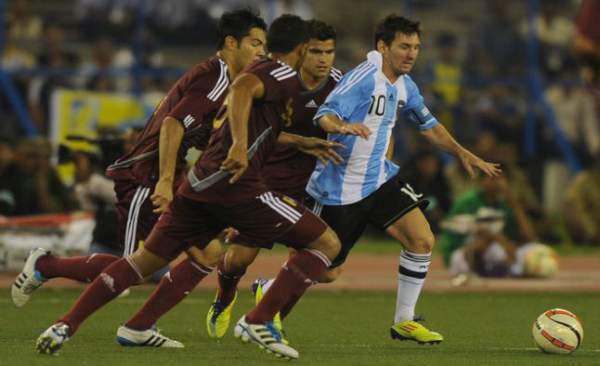 Both these teams have played 11 games against each other, and Argentina has won 10 games and Venezuela have won one. Argentina won against them in the Copa America this year and Venezuela the last won against them in 2014 World Cup qualification. Argentina has been in excellent form in the qualification as they have won four games, scoring 7 goals and conceded four. They have a very talented team but luck hasn’t been on their side as they have lost two consecutive finals, the first one in 2014 FIFA World Cup and the second one in Copa America in 2016. They played against Uruguay in their last game of the qualifiers and won the game by 1-0. Messi scored the only goal in the 43rd minute as he scored by going past through three defenders and scoring with his left foot. Hernandez, Rosales, Vizcarrondo, Fletecher, Angel, Penaranda, Juanpi, Figuera, Rincon, Rondon, Martinez. Romero, Mas, Zabaleta, Mori, Otamendi, Messi, Biglia, Dybala, Mascherano, Di Maria, Pratto. Come back for the match result, full video highlights, scorecard, and much more. Don’t forget to share it on social media sites like Facebook, Twitter, Google Plus, etc. to let others also know. Stay tuned to The Reporter Times for latest football news and all other sports updates across the globe.